Whether the Constitutional Treaty will enter into effect¿or the prospect of the EU having a constitutional text is pushed back to a much more distant future the ratification of an EU Constitution raises questions of fundamental importance from the point of view of national constitutional law. Whilst constitutions have traditionally been linked to states, more recent theories, such as post-national, multi-level, or intertwined constitutionalism, recognise the possibility for a constitution to exist in a non-state context. In this very valuable book, which focuses on the ratification of the European Constitutional Treaty, twenty-eight authorities in constitutional and EU law examine the extent to which such theories have made inroads in national constitutional thinking. eurosceptic fears of the development of a super-state. The book is based on the proceedings of an international conference that was held in Tallinn, Estonia, in November 2005. By assessing the implications of the European Constitution from the perspective of national constitutional law, this book fills an important gap in the literature. It also makes a contribution to the emergence of a true European-wide constitutional debate, by providing both researchers and policy-makers with comparative information regarding the constitutional aspects of ratification in Member States. It will be of absorbing interest and value for years to come as the European constitutional debate continues. 1. Introduction: The European Constitution and National Constitutions in the Context of `Post-national Constitutionalism; A. Albi. PART I. Ratification of the Constitutional Treaty and Its Impact on National Constitutions. 2. Ratification of the European Constitution in Lithuania and its Impact on the National Constitutional System; I. Jarukaitis. 3. Ratification of the European Constitution in Hungary: Problems and Challenges; J. Czuczai. 4. The Ratification of the European Constitutional Treaty in Italy; M. Cartabia. 5. Spain's Ratification of the Treaty Establishing a Constitution for Europe: Prior Constitutional Review, Referendum and Parliamentary Approval; P. Perez Tremps, A. Saiz Arnaiz. 6. Germany and the EU Constitutional Treaty; R. Arnold. 7. Belgium: The Lock-through System; F. Delpérée. 8. Ratification of the European Constitution in Estonia: A New Constitution for Estonia? J. Laffranque. 9. The European Constitution in the Far North, in a Country Called Suomi; T. Ojanen. PART II. Obstacles to the Ratification of the Constitutional Treaty and Issues for National Constitutions. 10. French Reactions to the Treaty Establishing a Constitution for Europe: From Constitutional Welcome to Popular Rejection; J. Ziller. 11. The Dutch Constitution, the European Constitution and the Referendum in The Netherlands; L. Besselink. PART III. Adjournment of the Ratification of the Constitutional Treaty: Wait and See? 12. The United Kingdom: A Tragi-Comedy in Three Acts; C. Church. 13. Ratification of the European Constitution: Implications for Ireland; G. Hogan. 14. Denmark's Waning Constitutionalism and Article 20 of the Constitution on Transfer of Sovereignty; H. Rasmussen . 15. Ratification without Debate and Debate without Ratification: The European Constitution in Slovakia and the Czech Republic; Z. Kühn. 16. The Polish Constitution, the European Constitutional Treaty and the Principle of Supremacy; A. Lazowski. 17. Sweden's Possible Ratification of the EU Constitution: A Case-study of `Wait and See; J. Nergelius. 18. A View from a Candidate Country: Implications of (Non)-Ratification of the Constitutional Treaty for Croatia; S. Rodin, T. apeta. PART IV. Ratification in Light of the Nature and Content of the Constitutional Treaty and the Instrument of Referendum. 19. 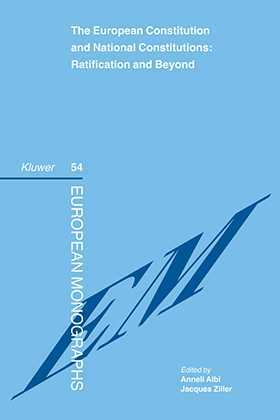 The Treaty Establishing a Constitution for Europe: Some General Reflections on its Character and Prospects for Ratification; J. Schwarze. 20. Institutional Changes in the Constitutional Treaty: A Reason for its Rejection? P.-C. Müller-Graff. 21. The European Constitution and the Role of National Parliaments: Hard Law Language, Soft Content; P. Kiiver. 22 . The European Constitution and the Role of National Constitutional Courts; M. Claes. 23. Reconciling Widening and Deepening: Enlargement as a Vehicle to Break the Unions Constitutional Deadlock; S. Blockmans. 24. National Referendums in the Process of European Integration: Time for Change; A. Auer. 25. Electorates v Politicians: The 2005 French and Dutch Referendums on the EU Constitutional Treaty; G. Tridimas, T. Tridimas. 26. Conclusions; J. Ziller. Appendix: Table of Countries. Table of Statutes. Table of Cases.